Based on the high performance VIA Apollo P4X266 chipset, the VIA P4XV-M mainboard combines support for high bandwidth DDR266 SDRAM with onboard LAN and audio features to provide a flexible and cost-effective platform for building powerful Intel® Pentium® 4 processor based PC systems and workstations. The VIA P4XV-M is designed to support a full range of 423-pin Intel® Pentium® 4 processors and complements its 400MHz Front Side Bus with support for up to 2GB of high bandwidth DDR266 SDRAM to provide all the headroom necessary for running even the most intensive Internet, multimedia, and extreme 3D gaming applications. Overall system performance is further enhanced by the high speed V-Link bus, which doubles communication bandwidth between the VIA Apollo P4X266 chipset's North and South Bridge to 266MB per second, as well as support for AGP4X and Ultra ATA-100. Based on the compact MicroATX form factor with dimensions of 24.5cm x 24.5cm, the VIA P4XV-M features an onboard VIA VT1611A AC'97 controller for high quality audio performance and also provides room for expansion through three PCI slots and a complete set of I/O ports. 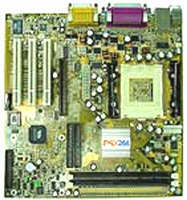 VIA Apollo P4X266 chipset based MicroATX mainboard for the 423-pin Intel® Pentium® 4 Processor combining high bandwidth DDR266 SDRAM support with integrated LAN and onboard AC'97 Audio.